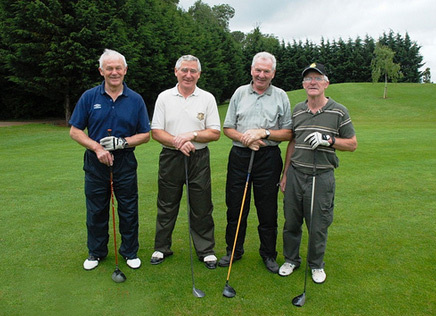 The 2019 Naomh Mearnóg Golf Society (NMGS) outings have been announced so all members and friends of Naomh Mearnóg who play golf or have an interest in playing golf are invited to sign up. Green fees quoted above are for paid society members only. GUI handicaps and rules will be enforced and if you do not have a GUI handicap, then a society handicap of 18 will apply subject to GUI rules over governing handicaps. There will be five events during the year including a ‘Turkey Shoot’ closer to Christmas. It is envisaged that all courses will be local, and available at competitive and affordable rates. One of the goals of the society is to support the club bar after events! Tee-off times will be from lunchtime onwards depending on demand. Prizes and a full dinner in the club will be available afterwards, with full coverage of all the majors. You must participate and complete four of the five events (‘Turkey Shoot’ not included) to qualify for our Golfer of the Year award. Entry fee for 2019 will be €50 (non-refundable). That money will be spread evenly across the five events (i.e. €10 will be contributed towards every event) provided you play golf on the day. If you do not play golf on the day, the society will retain the the €10 which will go into the prize fund for the Turkey Shoot at the end of the year. If interested in signing up, please use our online sign-up option or annual subscription forms located behind the clubhouse bar. Membership must be paid in full before the first event to participate and you cannot play any event without joining the society. It is important to recognise and say thank you to those who sponsor our outings. It is a big contributor to the success of the Naomh Mearnóg golf society. If you have any questions, please send an e-mail to naomhmearnoggs@gmail.com.